Seth Holcomb and Laney Nicholson were arrested on Saturday for allegedly robbing a gas station in Huntsville, Alabama. While the saying is to “never bring a knife to a gun fight,” after an altercation between two alleged robbers and a gas station clerk, it seems the same can be said for bringing a knife to a machete fight. 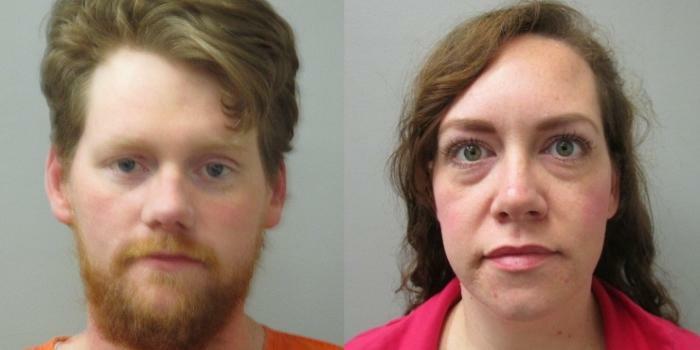 Seth Holcomb, 32, and Laney Nicholson, 33, were arrested on Saturday morning for allegedly robbing a Sunoco gas station in Huntsville, Alabama. A video of the altercation, obtained by WTKR, showed Holcomb with a knife behind the counter, standing across from the clerk, whose name has not been released. In the clerk’s hand was a machete. Huntsville Police Department Lieutenant Michael Johnson told Newsweek that Holcomb went into the store and made a purchase, but on a subsequent trip to the counter, he pulled out the knife and demanded cash. After Holcomb’s demand, the clerk locked the door and brandished his own weapon. In the video, Holcomb was seen running from behind the counter toward the door, at which point he repeatedly tried to pry it open. Ultimately, he was able to push the door open, seemingly breaking it off the frame. The fight, according to the video, continued outside, where Nicholson was standing at the car. While the clerk was outside fighting with Nicholson, who also had a knife, Johnson said that Holcomb ran inside and grabbed the cash drawer from the register. Holcomb and Nicholson were able to get into the car and drive away, but officers arrested them about a half of a mile away. Johnson said the clerk called the police while the two were in the store, which gave officers time to be in the area when they drove off. Given that it was around 2:00 a.m. or 3:00 a.m. EST, the car was one of the only ones on the road, so it wasn’t hard for officers to identify them. Holcomb and Nicholson were both charged with first-degree robbery, as well as criminal mischief. Holcomb faced an additional charge of theft of property in the fourth degree and Nicholson was also charged with assault in the third degree. In Alabama, first-degree robbery is a Class A felony and is punishable by up to life in prison. Johnson told Newsweek that the gas station clerk was not charged. Alabama’s laws regarding knives largely pertain to concealment and the machete was not concealed, plus, Johnson said, the clerk was on his own property. “One fundamental issue is that clerk was on his own property, he could carry almost any weapon necessary to protect his business with the exception of already certain federally regulated firearms,” Johnson said.